The White House is looking for ways to remove an enemy of Turkish President Recep Tayyip Erdoğan from the US in order to placate Turkey over the murder of journalist Jamal Khashoggi, NBC News reported on Thursday, citing two senior US officials and two other people briefed on the requests. Trump administration officials last month asked federal law enforcement agencies to examine legal ways of removing exiled Turkish cleric Fethullah Gülen in an attempt to persuade Erdoğan to ease pressure on the Saudi government, the four sources said. The effort includes directives to the Justice Department and FBI that officials reopen Turkey’s case for his extradition as well as a request to the Homeland Security Department for information about his legal status, the four people said. They said the White House specifically wanted details about Gülen’s residency status in the US. Gülen has a Green Card, according to two people familiar with the matter. He has been living in Pennsylvania since the late 1990s. Career officials at the agencies pushed back on the White House requests, the US officials and people briefed on the requests said. “At first there were eye rolls, but once they realized it was a serious request, the career guys were furious,” said a senior US official involved in the process. A Turkish official said the government does not link its concerns about the Khashoggi murder with Gülen’s extradition case. The secret effort to resolve one of the leading tensions in US-Turkey relations – Gülen’s residence in the US – provides a window into how President Donald Trump is trying to navigate hostility between two key allies after Saudi officials murdered Khashoggi on Oct. 2 at the kingdom’s consulate general in İstanbul. It suggests the White House could be looking for ways to contain Erdoğan’s ire over the murder while preserving Trump’s close alliance with Saudi Arabia’s controversial de facto leader, Crown Prince Mohammed bin Salman. One option that Turkish and Trump administration officials recently discussed is forcing Gülen to relocate to South Africa rather than sending him directly to Turkey if extradition is not possible, said the US officials and people briefed on the discussions. 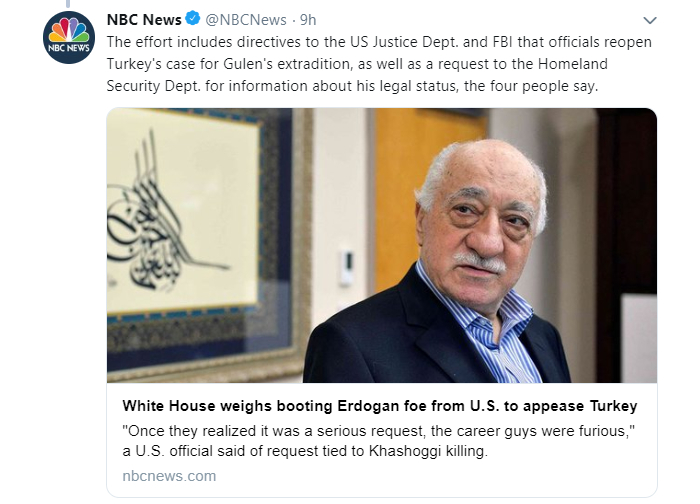 But the US does not have any legal justification to send Gülen to South Africa, they said, so that wouldn’t be a viable option unless he went willingly. Erdoğan has for years demanded the US send Gülen back to Turkey. The Turkish leader accuses the elderly cleric of being a terrorist who was behind a failed coup against Erdoğan’s government in 2016. After the coup attempt, Ankara made a formal request to the US for Gülen’s extradition. Justice Department officials responded to the White House’s request saying the review of Turkey’s case against Gülen two years ago showed no basis for his extradition and that no new evidence to justify it has emerged, the US officials and others familiar with the requests said. Gülen, who has lived in self-imposed exile in the US for almost two decades, denies any involvement in the failed coup in Turkey in 2016. A one-time ally of Erdoğan, he has become an influential cleric with a wide network of followers. His movement includes a host of non-profit organizations, businesses and schools in the US.